The Oric also use an AY-3-8910 as its sound chip, and I never heard the audio saturate in all conditions. This schematic is of course much more complexe than what we need, as we don’t drive a keyboard, and we don’t need an amplifier like the Oric who used a standard HP. 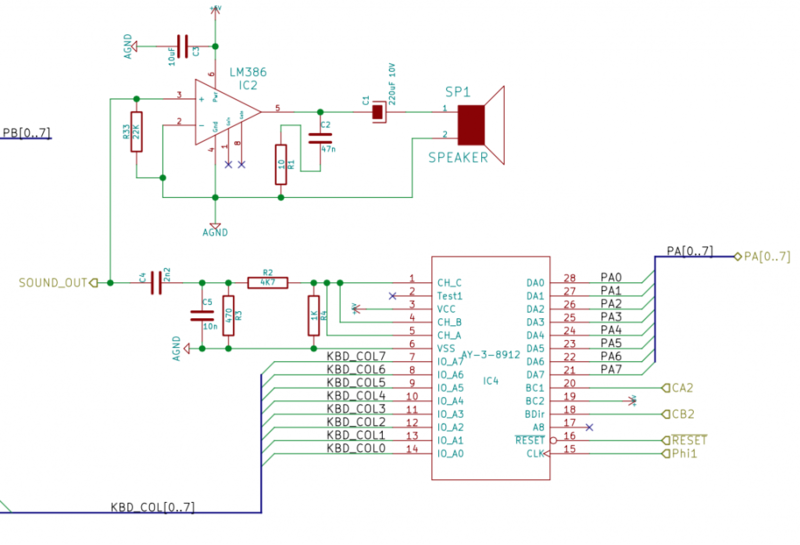 For normal headphone and externally amplified HP, something near a line-out is sufficient, and if you look at the schematic it’s exactly what the “SOUND_OUT” output port have, so we will need only a few passive component to give the output a better shape. What is interesting in this schematic is that it is made from a low pass filter and a high pass filter. I’ve made a breadboard schematics for those of you who want one: I used chemical capacitor on the drawing, but you may not find chemical of that capacity, on the original schematic, C1(C5) is a ceramic capacitor, and C2(C4) is a tantalum one. But the most important information is the capacitance in farad, not the capacitor type, at least for this application. I will try to update quite soon the repository of this project with this new schematic and a few bug fix on the software. Previous PostOric Schematic Issue 7Next PostWhat’s that ? bon, c’est mieux au niveau de la saturation, mais pour le son final il est quasi-inaudible : auparavant je pouvais brancher directement des écouteurs et ça allait, maintenant aux écouteurs on n’entend presque rien. Si je branche un enregistreur en sortie ligne, ça permet d’augmenter le son, mais s’il ressemble un peu plus à la vraie musique (plus de saturation), en revanche le son est très froid et déséquilibré au niveau de l’équaliseur, comme si ça passait à la radio. Sinon au niveau de ton schéma, je me demande s’il n’y a pas des inversions, par rapport au plan plus haut je pense que le condensateur près de la sortie fait 2,2 nF et non pas 10, et celui d’avant fait 10 nF et non pas 2,2 uF (nano, pas micro) non ? 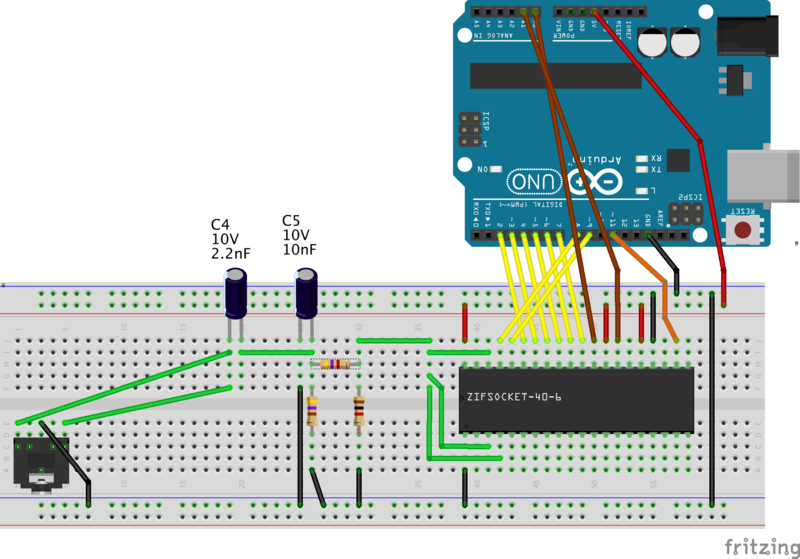 Un truc qui serait cool aussi, c’est de pouvoir lire le fichier mym depuis une carte sd sur l’arduino, ce qui lui permettrait d’être autonome. Tu saurais comment faire ? Je vais regarder c’est vite fait de faire une erreur de saisie. Pour la carte SD c’était prévu, au moment de la parution de l’avant dernier article sur ce sujet, mais des soucis de type ordicafé on forcé a mettre le projet en pause. it can use real AY with music streamed from sd card, or even an AY emulator in Atmega8. That’s very interesting, especially if you can use this propeller chip as a complete replacement of the AY. The propeller chip (P8X32A) with its DIP 40 is of course the same size of an AY-3-8910. I’ve already heard of propeller but i’ve never ordered any yet. The P8X32A is 8 times the price of an atmega8, but it’s also much more powerful and I like the fact they open sourced their chip. The SidCog sounds cool too. I’ll probably order a couple of P8X32A and an usb programmer. The Propeller have it’s own advantages and disadvantages, but it’s a really nice chip to work with. My Oric Mouse project use one for all the PS/2 and communication with the Oric. The “big” issue with the Propeller is it’s somewhat 5V tolerant, but it is not a 5V chip, so it’s can’t be used as a drop-in remplacement for an AY, you will need to add buffers on the IO for the 5V communication. I think someone on the Parallax forum have made a software around AYcog that allow to use a Propeller as an AY chip. Are the caps on your breadboard diagram swapped? The schematic shows the 10nf going to ground and the 2.2nf going to the line out. I’m a software guy who can’t count above, below, or between true and false, so I’m not sure. One other thing. I had to properly reset the sound chip before I got any sound. I added code to the sketch to use another pin for /RESET and hold it low for 500ms before doing anything with the sound chip.